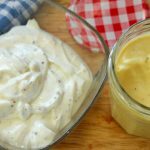 Egg Free Keto Mayonnaise - Headbanger's Kitchen - Keto All The Way! Mayonnaise is an essential item on the keto diet – it’s high in fat, packs a flavour punch and brings your salads to life. So here is how you make a keto mayonnaise at home, from scratch. That’s not all, I’ve done an egg free version as well for those who either don’t like eggs, are allergic or are ‘pure vegetarian’ as we say in India. Of course if you eat eggs, just make the regular Keto Mayonnaise. What do you do with Mayo? Mayo is super high in fat. This is perfect for the Keto diet and now since we’ve made it with a good quality oil, we’ve pretty much found the easiest way to hit our fat macros. I personally love to use it to dress my salads, mix up a spoon of pesto with mayo and you have a lovely dressing for your salad. If you have a hankering for something Asian then mix the mayo with a little peanut butter, some vinegar and soya sauce and you have an Asian style salad dress. The world is yours for the taking now, or rather your salads are yours for the dressing. So play around with flavours and enjoy! This recipe makes 16 servings. 1 Serving = 1 Tablespoon. Get this recipe on myfitnesspal. 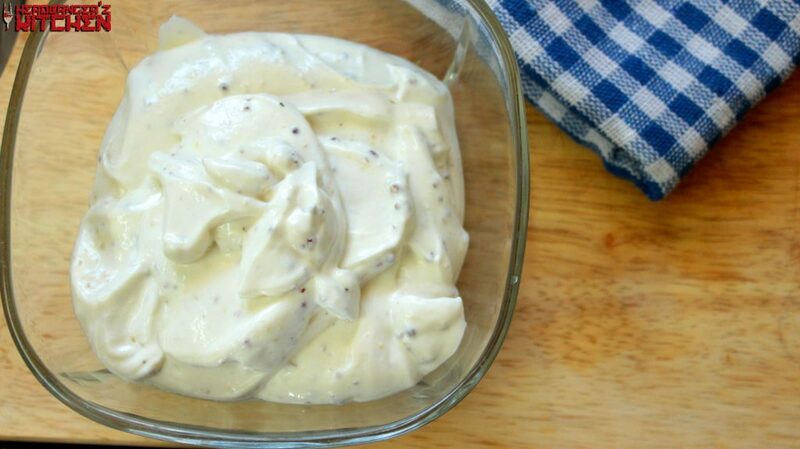 An egg free mayonnaise recipe. Add the oil and blend till a nice creamy mayo has been formed. Is the cream whipped? Or is it sour cream? I think here you have to fix the tbsp for tsp as well. great job with your recipes and comments. thx. How long does this mayonnaise last? That’s the oil you are using. Can I use avocado oil? Been looking forever for an egg-free version! The female of the house doesn’t like using raw eggs in stuff. Thanks! Made this yesterday, and it pretty much turned into butter. So watched the video again and noticed that the cream was already whipped before adding the other stuff, and that the olive oil was added all at once instead of pouring in a thin stream like other mayos, which means a longer blending time, hence the cream that turned into butter. So I made it just like the video again this morning using my little handheld blender instead of my food processor, and it turned out perfectly! Now I have both mayo AND a great seasoned butter I plan to use on steaks and fish! So nothing was wasted! I tried all the excat same ingredients given but it turned out to be very watery…blended many times but no use ..way I can add to make it creamy other than avacado otherwise it will be wasted. Please guide. Did you make the cream on? Or the regular one with egg? If you are using the cream one then put it in the fridge it firms up. Also you can add cream cheese to thicken it up. You say in the video Lemon juice, but the written recipe says Lime juice…which one do I use? I live in India so I don’t get lemons so I use lime juice. If you have lemons use those. Just about a teaspoon or so. All the measurements are in the recipe box. Hi, can the fresh Cream be Amul Fresh Cream? the link leads me to options for Cocoa Butter. Yes it’s Amul Fresh cream only. You can also use D’Electa or cream from your local dairy. I will fix the link now.